At the end of this June, the Hague-based Permanent Court of Arbitration has finally appointed the date when the ruling in the suit filed by the Philippines will be announced. Ultimately, the Philippines questions the legitimacy of China’s claims of islands and reefs within about 90 percent of the South China Sea. The ruling that is expected to shatter China’s “historical claim” should be made public on July 12, 2016. Since China has never had any illusions as to the nature of the UN body’s decision (as this organization is heavily influenced by the US, China’s core geopolitical opponent and an ally of the Philippines), Beijing’s official position was expressed in a form of “three concerns” about: (i) the legitimacy of this court procedure; (ii) China’s right to denounce it; (iii) China’s right to disregard the Hague Arbitration Court’s ruling. Despite other countries of Southeast Asia are also contesting China’s territorial claims in the South China Sea, the dispute between China on the one hand, and the Philippines and Vietnam—on the other, remains the most uncompromising. The last time the tension spiked was at the end of 2012, beginning of 2013 when, in the wake of a standoff of Chinese and Filipino war ships near the reef of Scarborough Shoal (situated 200 km from Luzon, the Philippine’s main island, and 800 km from the Chinese Hainan island), Manila filed a suit case with the Hague Arbitration Tribunal in January 2013. A year later, the parties engaged in a saber rattling in the southern part of the South China Sea, near the reef marked as the Second Thomas Shoal on the nautical charts. The reef, which is located in the so-called nine-dash line area, which China uses to claim its maritime rights in the South China Sea, is only 150 km from the Philippine Palawan Island, while a long distance from Hainan Island. 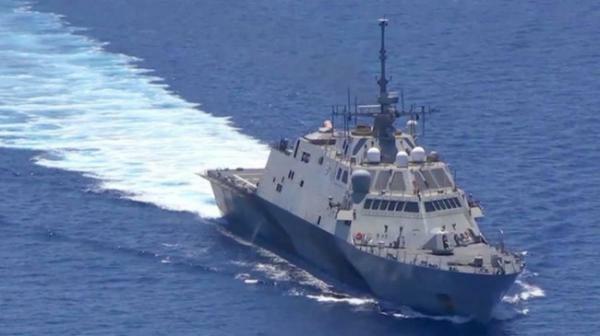 In 1999, the Philippines grounded a former U.S. Navy warship on the Second Thomas Shoal. The ship was built by the US in 1944 to carry out landing operations in the Pacific during WWII. Though since that time the ship has rusted out and its crew consists of only 10-15 sailors, it is there to symbolize the Philippines’ claim of the reef. A daily solemn flag-raising ceremony with the ship’s crew gathering on the deck of a broken rusting hulk looks rather odd. But this is only one element of the grim picture depicting the situation in the South China Sea, with a standoff between the leading global powers—the US and China—being its focal point. To add insult to injury, Japan has been demonstrating as clearly as never before its readiness to ally with the US. The probability of India joining the US-Japanese alliance (at least in some form) is also high. In view of the above, the Malabar Joint Naval Exercise conducted this June by the US, Indian and Japanese fleets in the area adjoining the South China Sea looks very symbolic. Admiral Harris, Commander, United States Pacific Command, who during his recent visit to New Delhi had openly supported the idea of a military and political alliance between the US, Japan, India and Australia, showed genuine interest in Malabar. What is especially noteworthy—he mentioned the South China Sea and Southeast Asia as the region of interest for the “alliance-to-be“. The US Navy has been “running the show” in the South China Sea for a long time now. This year Japanese Navy has entered the region’s military dimension (so far as an independent party). The policy toward the convergence of India and Vietnam has also been taking shape. That means that soon the South China Sea might witness the arrival of Indian naval ships. As it was mentioned already, no matter what ruling will be worked out by The Hague Arbitration Tribunal, it would not affect the military and strategic situation in the South China Sea. China will apparently continue the construction of artificial islands it needs for the deployment of its military infrastructure. The US, on the other hand, will not recognize the legitimacy of China’s right to the territorial waters around the artificial reefs. However, if the international court rules against Beijing, the US leadership’s private opinion that China’s territorial claims in the South China Sea are invalid will have legitimate grounds under international law. Thus, granting American ships and warplanes the right to freely sail in and fly over the area of the controversial islands. Beijing has always deemed such actions of the US military to be provocations entailing serious consequences. It would be worthwhile to briefly cover the issue concerning the recent change of Filipino leadership and possible improvement of relations with Beijing. At least this is what Rodrigo Duterte, who was sworn in as President of the Philippines on May 30 after a landslide election victory has stated. Beijing welcomes such verbal assurances and, in its turn, voices its desire to also develop bilateral relations, and, first of all, economic ties. However, there remains a question of how much “room” will both countries have for maneuvering when working out decisions aimed at the improvement of relations. Most probably not much since there exists an ultimate obstacle complicating the bilateral relation, namely the contradicting territorial claims over the areas of the South China Sea. It should be stressed once again that neither China nor the Philippines would be willing to give in regardless of the international court’s ruling. That basically means that the main fighter for the “world order and compliance with the norms of international law” will continue stepping up its presence (along with its de jure and de facto allies) in the South China Sea to assure the “stability and freedom of navigation” in the region. And it will have a legal right to do so following the international court’s ruling. Thus, Washington’s plans will bring to naught the reconciliatory efforts of China and the Philippines stripping the Pacific Rim’s hopes to see an improvement of the situation in the region.